I frequently organize birdwatching, wildlife, and sightseeing tours for visitors who are interested in exploring the flora and fauna diversity in tropical rainforest and coastal areas of Raja Ampat. Located in the western region of West Papua, the islands are the natural habitat of hundreds of species of birds including parrots, pigeons, fruit doves, fantails, owls, eagles, and various species of Kingfishers. Around 2 weeks ago, I visited Waigeo island of Raja Ampat to watch birds that like to find fruits and prey in trees near the coastal area. There was a beach in the southern area of the island. Its name was Warduwer. It was a nice place for visitors who like to enjoy swimming, snorkeling and freediving. There were also big trees such as ficus, catappa, coconuts and various other trees on land. I visited that beach several times. I saw a lot of birds during those visits. Because there was no house at the beach, the little forest in the area was quiet during the day. Birds landed on the branches of the trees to take a rest. 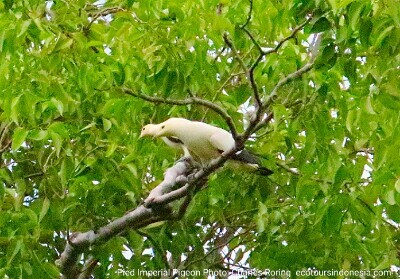 There were tens of Pied Imperial Pigeon flying in a large formation in the air. Soon they landed on trees of the Warduwer beach and sat there for quite long. I took the opportunity to shoot one couple using my D-SLR camera Canon 200D and telephoto lens Tamron 150-600 mm G2. 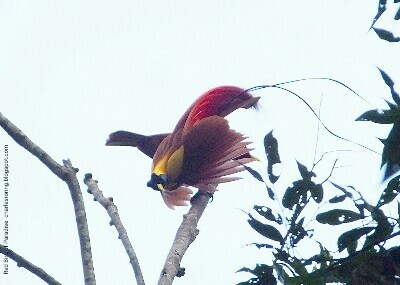 During that day, I saw: Papuan Blyth's Hornbill, Eastern Osprey, Palm Cockatoo, Eclectus Parrot, and Brahminy Kite in the forest. It was sunny and hot. I left the beach at around 15.00. Suddenly the weather changed. Strong wind brought thick clouds over the airport area. I was birding along a small river near the airport when the heavy rain came. I ran into a small wooden kiosk whose structure was built on the sea water. There, I enjoyed hot tea and some fried donuts. Twenty minutes later, it stopped. So, I walked out of the small kiosk to do birdwatching again. This time I saw Puff-backed Meliphaga. There were some of them playing on a fallen tree who leaves had dropped to the ground. One of them caught an insect as his lunch. He was quite close to me. Carefully I aimed my camera at the bird and shot him several times. Unfortunately, the rain fell again. The storm was pouring with stronger wind. I ran to the kiosk for shelter. I waited there for around one hour until the sky became clear from the thick clouds. I and my friends returned to Waisai at 18.00. In addition to birds that I mentioned above, I also saw Beach Kingfisher, Willie Wagtail, female Red Bird of Paradise, Sulphur-crested Cockatoo, Pacific Swallow, Helmetted Friarbird, Brahminy Kite, Eastern Osprey, Dusky Scrubfowl, Spangled Drongo, Moluccan Starling, Cattle Egret, Olive-backed Sunbird, Lesser Frigatebird, Yellow-faced Myna, Pinon Imperial Pigeon, Violet-necked Lory, and Torresian Crow. 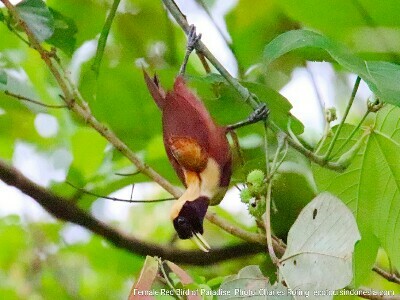 Deeper exploration into the tropical rainforest of Waigeo island will enable us to watch Red Bird of Paradise (Paradisaea rubra) and Wilson's Bird of Paradise (Cicinnurus respublica). Raja Ampat is a great place for birdwatching. 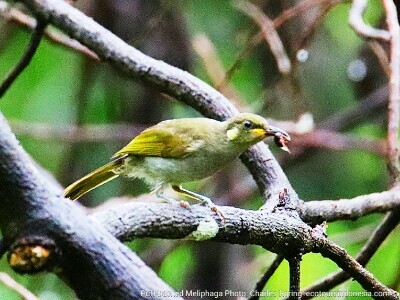 Participants of the tour can watch both sea birds and forest birds including the migratory ones. Most often, I combine the birding tour with sightseeing trip to karst islets and snorkeling activity at the house reef of the guesthouse where we stay. It is easy to go to Raja Ampat islands. Just fly from your country to Jakarta (the capital of Indonesia). After that you could continue your trip to Sorong city. I could meet you at the airport and arrange your trip to the islands. You could buy your ticket through traveloka.com. You need to bring your own binoculars, and mask, snorkel, and fins if you want to enjoy birding and snorkeling in these islands. If you are interested in traveling to Raja Ampat and want me (Charles Roring) to organize your trip, please, contact me by email to: peace4wp@gmail.com or by whatsapp to: +6281332245180.